I should probably stop reading Texas stories by authors not from Texas. I keep stumbling over all these little bitty minor things that just throw me right out of the story. And they really are minor. Not important to the actual story--just to the Texas-ness of the story. To the feel and reality of the setting. Do I really have to go back to the distance thing? Really? Fort Hood is between Waco and Austin, wrapped around Killeen and Copperas Cove. Killeen is where they're having the trial for the Fort Hood shooter guy. Or where all the reporters are staying, anyway. Copperas Cove is where Heisman Trophy winner Robert Griffin III (fellow Baylor Bear) is from. It is pretty close to Austin--maybe an hour's drive away, and the same to Waco. (Waco is in that 200,000 population range, remember.) It is not close to Dallas. It's over 2 hours' drive away. More, if you have to drive through Dallas because your small town is north of the big city. Texas has a lot of big cities. Authors should take a look at a map and see which ones are near your mythical location. And maybe take a little look at the size of towns. However, this blog is going to be about the Texas climate. Most people understand that Texas is hot. But a lot of them don't seem to realize just what that means. One thing it means is that summer lasts a really long time. My daughter grew up in central Texas. After her marriage, she and her husband both went to Carnegie-Mellon University in Pittsburgh--the one in Pennsylvania, not the one in East Texas--to earn their doctorate degrees. And every year in August she complained, because August was not the hottest month of the summer. It was already starting to cool off there in Pennsylvania, and that, according to her, is just wrong. In Texas, August is unbearable. It's the hot month. It's the month those of us on the coast--and inland--really start watching for hurricanes. We just replenished all our hurricane supplies for this year. Of course, living on the coast, we are wary of the hurricanes. When we lived in Whitney, north of Waco, we liked the hurricanes. We hoped one would come our way, especially during a drought. Remember the distance thing. Waco is over 200 miles from the coast--about 4 hours' driving time. By the time a hurricane travels that distance, it's basically a big rainstorm. A hurricane can break a persistent high pressure zone and drought. So all of the folks inland this year and in 2011, the year of the Bastrop fire and extreme drought, would really like to see a Category 1 or 2 hurricane. That said, I want you all to realize that it's still hot in September. I have lived in most parts of the state of Texas, including the northernmost. (The Panhandle is never called North Texas. It's the Panhandle. North Texas is the Dallas-Fort Worth area east to Commerce, west to about Weatherford and north to the Oklahoma border.) The Panhandle has actual winter. The rest of Texas pretty much doesn't. At least not more than a couple of weeks at a time. Anyway, even in the Panhandle, it's still hot in September. Like over 90F/32C. And it doesn't cool off until the first blue norther (not "northerner") comes through. Anywhere in Texas. And most of those don't barrel through until late September. Sept. 19 to 21--near the actual fall equinox--is the most common date. And they don't cool it off much. It might drop the afternoon high in Amarillo to 60F/16C, but it will warm up again. Fall doesn't arrive gradually in Texas. It's: hot, hot, hot, hot, hot, blue norther--really chilly--reasonable. Sort of. That first cold front sort of shocks fall into existence. And in the Panhandle, sometimes it was a real shocker. It might actually freeze overnight. And all the fruitless mulberry trees would lose their leaves at once. Whump. The back yards of the people with the trees would suddenly be ankle-deep leaves. There is a saying--not the one about "wait 10 minutes and the weather will change." The saying I'm referring to is: "The only thing between Texas and the North Pole is a couple strands of barb-wire fence." Which is true. Think about it. It's Great Plains all the way from the Rio Grande through Canada to the ice pack. There are no mountains. No lakes, really. Maybe a mesa or two, but they tend to be isolated. So when those cold fronts start rolling south, there is nothing to block those winds. Hence the way fall arrives. All at once, riding on a blue norther. But it doesn't stay cold. Or even chilly. The nicest fall month in Texas is October. Usually the trees do not lose their leaves until November. They're starting to sort of change in October, but usually, October is gorgeous. The temperatures are in the 70s. The sun is bright--I've had some bad sunburns in October because I don't protect myself like I should. I forget that it's still, well, the sun. And I'll go to one of those afternoon Baylor football games and just blister. One other thing you might want to be aware of: Most drinking water in Texas comes from lakes. It's surface water. So in the summer, the water gets warm. When I was growing up, my brother always had an old soda bottle in the refrigerator filled with water. I always drank all mine up and forgot to refill it. Which is probably why I like room-temperature water better these days. Thing is--room temperature water is cooler than the water that comes out of the tap. Tap water in August is seriously warm. Especially in the more southern areas. In the Panhandle the water actually gets cold in the winter and warmish in the summer. Outside the Panhandle, it gets cool in the winter and really warm in the summer. There are some springfed water systems, with cold water year round, but most places need more water than the springs can provide, hence the surface water sources. And even if it is ground water, keeping it in a water tower warms it up. So in the summer, making someone sit in a cold water bath isn't a punishment. It's pretty pleasant, actually. The first trees start blooming in February, when the redbuds break out.That's when spring starts, essentially. The temps start reaching 80F/27C and 90F/32C by April and May. If it stays below 95F/35C all the way to the end of May, it's been a cool spring. But really, Texas spring is more like summer elsewhere. Hotter than summers elsewhere. And winter tends to be sporadic. Except in the Panhandle, what Texans experience as winter more northern states would not recognize. Any part of the state can experience a freeze. They're extremely rare in the lower Rio Grande Valley--hence all the orange and grapefruit trees. But they can happen. My Norfolk Island pine in the back yard currently looks terrible because two years ago, we had a hard freeze that lasted most of a week. It killed the Norfolk pine at the Boy Scout office near my house, but ours survived, probably because it's so big. (I took the pic of it, but had trouble e-mailing it to myself. Sigh.) Usually, a freeze in Galveston isn't more than overnight. I mentioned driving through a howling blizzard between Lubbock and Amarillo. That is not unusual in the Panhandle. But once it passes, things warm up. In our little Panhandle town, our house faced south. I had pansies blooming all winter in my front flowerbed. And ice coating the patio all winter on the north side because it never got any sun. Downstate, ice storms are more common. Maybe once in the average winter in North Texas. Once every winter or two, or three, in Central Texas. But. It doesn't stay cold. There was one year when our kids were little that we had invited the fella's folks to our house for Christmas. But a hard freeze cold front rolled through two days before and froze our pipes. 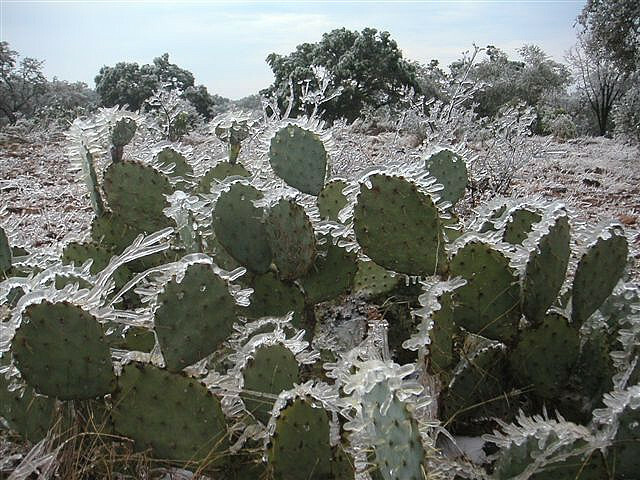 (Insulation tends to be laughable in much of Texas because it just doesn't get that cold that often for that long. Our pipes were in the garage. Without much insulation.) So we went north to the in-laws' house instead--they live between Dallas and Fort Worth. The day after Christmas, the fella and I went out shopping--I was wearing a new sweater I'd received as a gift, and I nearly boiled to death! The high that day was 80F/27C. So, four days difference, and the temperature went from 30F/-1C to 80F. That is a typical Texas winter. Yes, MY orchid. One of them. Outside. So when you're writing a story set in the fall, winter or spring, you can make the weather whatever you want, pretty much. As long as you remember it's not going to stay that way. If it's cold, it will warm up. If it's warm, it will cool down. Rapidly, in all likelihood. But summer comes earlier and fall later than you might realize. I don't bring my orchids inside until almost December. And they're back outside by the end of February. However, once it warms up, it stays hot. Yeah, the weather might change after 10 minutes, but it's not going to stop being hot. A thunderstorm will actually make things hotter, once the rain stops. Because after, it's so humid, the heat index goes up. And yes, just like wind chill is a real thing, heat index--which takes into account the humidity--is very real. Galveston Island does not get the extreme heat of much of the mainland, because the water in the Gulf keeps things cool. It's never topped 100F/38C here, though it does get to 95F and 97F frequently. However, the humidity is so high--being surrounded by water--that the heat index is often over 100F. Once upon a time, I refused to believe that my husband could tell when the temperature was over 100F/38C, until one record-setting summer when we were still in Whitney (just north of Waco). One of the newspapers ran a series on avoiding heat stroke, and I realized that 100F is a full degree above normal human body temperature. It's hotter than we are. And once the outside temp is hotter than we are, we stop shedding heat and start taking it on. Yes, you really can feel the difference between 99F and 100F. Most people have sense enough to take precautions when it gets that hot. 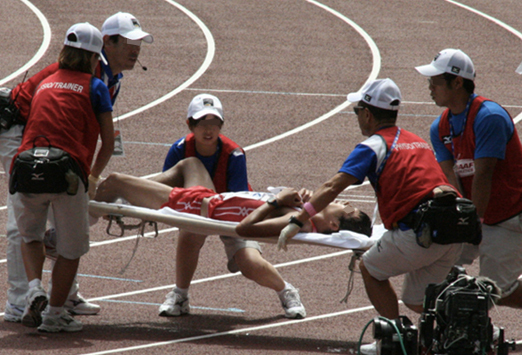 Heat is just as deadly as cold weather. But when it's very humid and the weather is cooler, it's easy to get heat stroke too, because the sweat the body uses to cool down doesn't dry off and internal heat just builds up. The heat is something that can be used in stories. In the Panhandle, where it's dry, the high temp during the day will often push 100F/38C, and then drop 30 degrees or more overnight. It usually doesn't drop more than 30 degrees unless a cold front is moving through, but it could. In the rest of the state, it usually doesn't drop more than 20 degrees. In fact, air conditioning can't cool much more than 20 degrees, so despite the setting, if it's 100F/38C outside, it's probably not going to get much better than 80F/27C inside. And if it was 100F yesterday afternoon in Dallas, it's probably going to be 80F at dawn the next day. Unless that blue norther is moving in... On the coast, there isn't that much change between the high and low temps. Galveston is rarely more than 9 degrees cooler in the morning than it was yesterday afternoon. Sometimes, it only drops 7 degrees, almost never as much as 10 degrees. Unless a cold front moves through. So that's a thing that's different from one part of the state to another. And it only gets warmer as you move farther south. The daughter (the one formerly in Pennsylvania) now lives in Georgia, at about the same northerliness as Dallas. However, Georgia doesn't seem to be as hot as Texas, and I'm not sure why. Yes, it's hot, but it's a gentler heat. Seems to be a more humid heat. And the temps don't seem to get as high. I have my childrens' towns plugged in to my weather app so I can see how hot it gets there--and the Georgia town is consistently cooler than the Texas cities. One reason might be the sun. Although I don't know how the sun could be different--it sure seems like it is. My sister lived in Taiwan with her family for three years, and she said that although it was hot and humid there, the sun did not seem like so much of an enemy there. It didn't beat down so hard, make things so much hotter. It does here. I used to laugh at the cows in the pastures all crowded up in the shade of the mesquite trees. First of all, mesquites are crummy trees. They're small, their leaves are thin and lacy and they don't make much shade. And the cows will crowd up under them until there's not a speck of shade left. 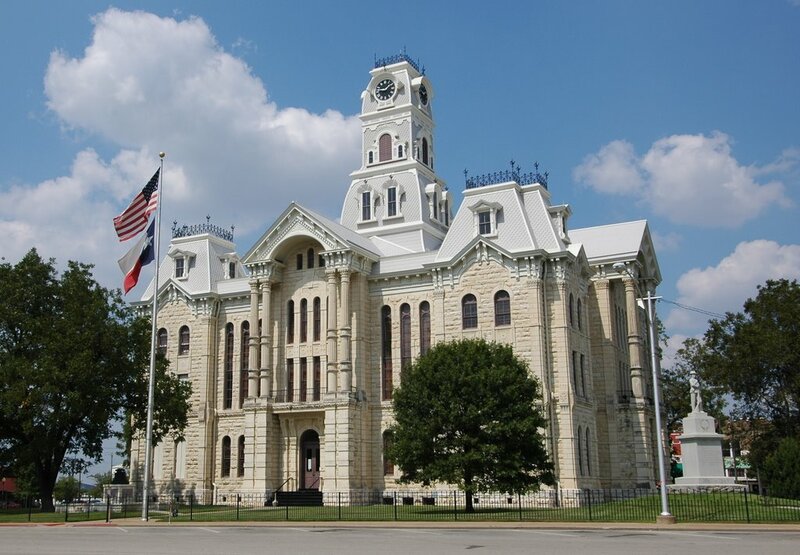 I laughed--until one day, when I was still working at the makeshift county courthouse in Hillsboro, in Hill County, Texas, and the judge came by scouring up all the workers he could for a newspaper photo op. The 1890 courthouse had burnt down the night of New Year's Day in 1992 and we were all housed in an old grocery storefront with plywood and chicken wire walls. I worked in that plywood and chicken wire office for 6 years until the restoration was completed. Anyway, somebody was making a donation to rebuild the historic courthouse and the judge wanted some lookers-on in the picture. 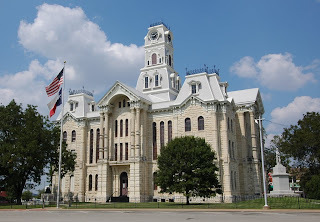 It was July or August, hot as blazes in the middle of the afternoon, not a cloud in the sky, and we had to walk the block from the Courthouse Annex to the courthouse square. Lordy, it was hot that day. But somehow, I found a tiny bit of space that was just a smidgen cooler--and when I looked around, I realized that we had all lined up in the shade of the flagpole. 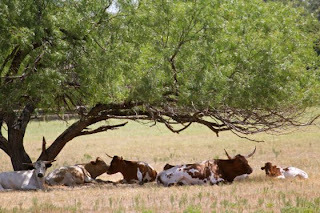 (They wouldn't let us get under the big old pecan tree...) Just that little stripe of shade, and it was enough to give us some relief from the sun. 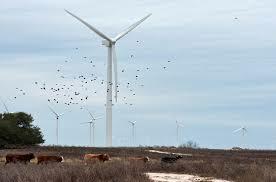 Again, these blogposts do not intend to be in any way scientific or comprehensive in their discussion of Texas. I'm just trying to explain a little about how things really are here and encourage writers to research the things it might not occur to them to research. And I'm hoping maybe to take those naked facts that research often offers up and try to show how those facts actually feel. What they can mean when you have to live them. I hope it helps. I decided to go south and west before going due west. Probably mostly because I currently live in the Texas Gulf Coast Plain. Actually, I live off the Texas coast on one of those barrier sandbar islands like they have along Georgia and the Carolinas. The countryside along the Texas coast, from the Sabine River on the Louisiana border to the Rio Grande on the border with Mexico, is pretty much the same. It's flat, swampy and bordered with barrier islands or peninsulas. 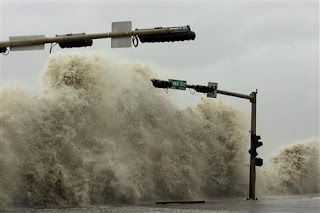 Just north of Galveston Island is Bolivar Peninsula. South of Galveston is Surfside, a beach community on another peninsula, I think. Bolivar is in Galveston County, and the most direct route to Beaumont and Louisiana. Surfside is in Brazoria County, so I don't know as much about it, but it's where we went to the beach when I was in high school in Houston back in the early '70s. Anyway, there are islands or peninsulas all the way south to Mexico. Padre Island extends all the way from Corpus Christi (about 2/3 of the way around the curve from Louisiana) to Brownsville (the city at the lower tip of the state). The coast is easily divided into thirds--Beaumont/Port Arthur/Orange is at the top, 1/3 of the way around is Galveston Bay, 2/3 is Corpus Christi Bay, and Brownsville is at the bottom. Corpus Christi Bay is a deep bay. There's a Navy base there, with ships and everything. The Houston Ship Channel runs through Galveston Bay. Ships line up in the Gulf waiting for a pilot to take them through Bolivar Pass between Galveston Island and Bolivar Peninsula and into the channel. The bay is very shallow. See the ships waiting right on the horizon? I remember watching a documentary on San Francisco Bay that stated something about it being shallow, that it's only 11 feet deep in places. And it made me laugh. People who have trouble with their speedboats in Galveston Bay don't always have to wait for someone to come rescue them. Odds are good that they can just jump out of the boat and walk it in. Much of Galveston Bay is only 3 to 4 feet deep. This is why the Houston Ship Channel is so important, and the dredging of the channel is pretty much non-stop. It's got to be deep enough to let these cargo ships through. And it's why a pilot is required to get the ships--the ones that can make it--up the channel to dock. Because the channel and the bay are tricky. Some of the supertankers are too big to pass through the ship channel. They anchor a few miles off shore from Galveston and lighters come out to transfer the crude oil to the port facilities. Actually, all the ships anchor off shore, but most of them are waiting for a pilot. For their turn to go up the channel. Some of them just stay out there. I took the picture of the waiting ships this morning. There are always ships out there, just on the horizon. 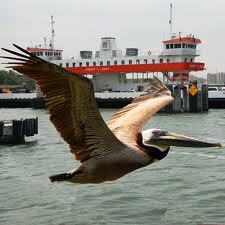 There's a free ferry from Galveston to Bolivar run by the Texas Department of Transportation. TexDoT also runs a ferry at Port Aransas, just north of Corpus Christi, (There is no K in Aransas. It is not Arkansas misspelled. And it is pronounced Ah-RAN-zas) as well as the Galveston-Bolivar Ferry. There's a bridge (toll) between Galveston and Surfside that crosses the San Luis Pass at the mouth of the Brazos River, and bridges between many of the other islands, and between the islands and the mainland. There has been talk of building a bridge across Bolivar Pass, but so far it hasn't gone anywhere and probably won't for a good while, because it's a wide gap and because the bridge would have to be high enough for all those ships to pass. Cruise ships dock in Galveston, and they would have to get by any bridge as well. The ferries are all named after various TEXDOT heads, and painted the colors of the university they went to. The one in the picture is orange, because obviously that namesake went to University of Texas. There's one painted maroon (for Texas A&M) and one painted green and gold (for Baylor University). I think one of the Galveston-Bolivar ferries is painted bright red, but I'm not sure where that namesake went. I don't remember if it's red and white (for Oklahoma, maybe?) or red and black (for Texas Tech). The coastal plain extends at least two counties in from the coast. All of that territory is extremely flat, not very much above sea level. Houston's elevation is 43 feet. Galveston's is around 11, overall. Corpus Christi's elevation is 7 feet. You can see why a hurricane could be a problem. This is one of the areas in the U.S. where rice can be grown. (Rice University in Houston is not named for the grain. It's named after William Marsh Rice who founded and financed it.) The climate is warm and moist, and there's usually plenty of water for flooding the rice paddies. Unless there's a drought. Because the climate is usually pretty wet and the plants are adapted to all that moisture, a drought can cause problems faster along the coast. There are lots of waterways and bridges along the coast. My youngest son lives in Brazoria County, about an hour's drive south of Galveston, depending on whether you take the Blue Water Highway down the island and over the San Luis Pass bridge to Surfside and across the bridge to the mainland at Freeport, or you go down the Farm to Market Roads on the mainland. Taking the mainland drive, we cross at least five bridges. Some have a high arch to allow boats to pass underneath. These are not rivers. 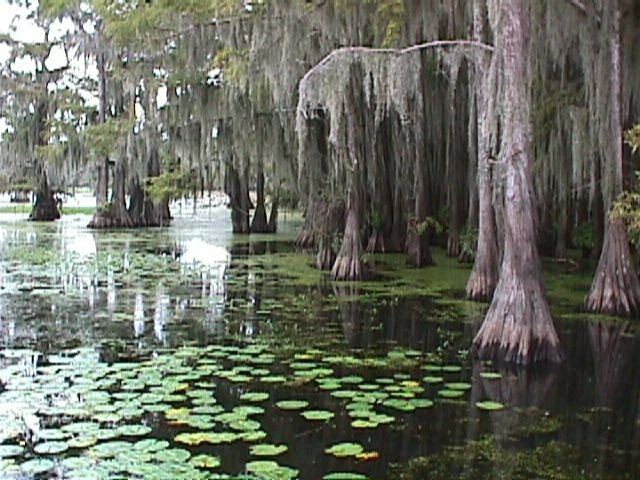 Most are bayous or some other bay inlet. 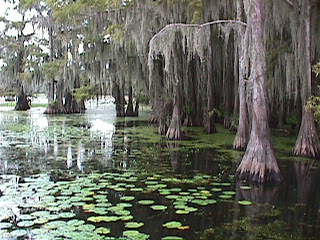 Oh, and in Texas, bayou is not pronounced "bye-yoo" as in Linda Ronstadt's "Blue Bayou." In Texas, it's properly pronounced "bye-yo" (rhymes with yo-yo). Houston is on the Buffalo Bye-yo. 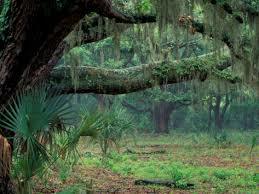 Along the coast, the live oaks tend to drip Spanish moss. The farther south you go, the more palmettos you'll find growing. And those sawtooth palmettos you find in Florida and at the nurseries? Native Texas palmettos don't have those sawtoothed edges. They're smooth along the edge. So they won't hurt you when you walk among them. Smack you in the face, yes, but not hurt you. Mexican fan palms are basically native and grow all along the coast, and you can plant and grow most other varieties of palms. A neighbor has some variety of date palm (probably non-edible, except by birds) that fall all over the street in late summer. The entire Texas Gulf Coast is in growing zone 9, with the very coastal edges in zone 9b (if that means anything to you), and the lower Rio Grande Valley in zone 10, where they grow oranges and Texas Ruby Red grapefruit. Basically, what this means is that semi-tropical plants will grow there. Bougainvillea, poinsettia, oleander, hibiscus, that sort of thing. Oh. 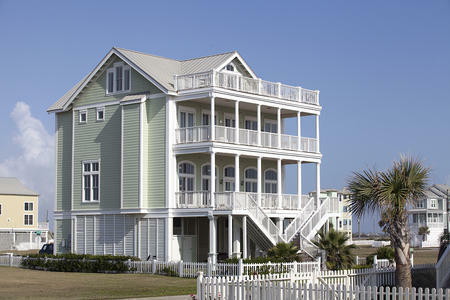 Pretty much all the beach houses are on stilts. Even the ginormous mansions. It's pretty amazing to see these huge houses sitting up in the air with garages and nothing underneath them. I've seen houses that looked like something out of Arabian Knights perched up above a big garage. Even the hotels are--basically--on stilts. Sometimes, they'll build up the earth under the foundation, or build big cement pilings and put the parking garage under there, but they're all elevated. So if your story has your characters going to South Padre Island or some beach house--they need to climb stairs or ride an elevator or something to get to the main floor. Remember those hurricanes? Because on the Gulf Coast--from Florida through Alabama, Mississippi, Louisiana to Texas--it's not a matter of if the hurricane will come. It's a matter of when. What else is there to say? What do you want to know? I'm not writing a definitive description of the State of Texas. I'm just hoping to bring up things about the state that writers ought to know, and point them in the direction of a little research that ought to be done. Okay, so I'm reading a book set in Texas, and as often happens, I'm trying to figure out where in Texas this book is supposedly set. I mean, it's a made-up town, but usually, one can figure out what part of Texas these made-up towns are placed. So far, I'm not having any luck, because--first off, the story says flat out "east Texas" for the location of this "ranch country" town. Which, if you've been reading my blog, you would know that East Texas and Ranch Country are mutually exclusive. Right? Right. Then, a bakery where the heroine works gets an order to deliver bread for a party in San Marcos. And while the story says something to the effect of "Wow, that's a long way," San Marcos is nowhere near East Texas. If you will take a gander at this handy map of The Big City Triangle here to the left, you will find San Marcos between Austin and San Antonio, just below the sign (non-functioning, I'm pretty sure) that says "Zoom to San Antonio map." Remember the map of East Texas, and what I said about the boundaries of East Texas? It's east of I-45. I don't really know anybody who would get bread delivered from 172 miles away (San Marcos to Huntsville). And if this ranch country town is close enough for a bread delivery to San Marcos --well then, that IS ranch country. So okay. But it's NOT East Texas. But that really wasn't what brought on my tangent. The story also had restaurants with wine and a bar and grill in the downtown of this little town. And Texas has really weird liquor laws. See, historically, the big religions in Texas (as through most of the South) are the Baptists, the Methodists and the Presbyterians. And all those folks tend to be fairly strict teetotalers. They don't drink alcohol and they don't want anybody else doing it. And the Texas State Legislature, being the traditional mess that it is, did their usual pass-the-buck job and left a lot of the laws about liquor up to the smaller governmental entities. Our experiences in the various rural counties where we have lived ought to be illuminating. When I lived in Hill County (county seat Hillsboro, where I-35 splits to go to Dallas and Fort Worth), Hillsboro didn't want any bars or restaurants selling "liquor by the drink." Meaning that you couldn't get a beer or margarita to go with your Mexican food. In fact, you couldn't even buy beer or wine--in the grocery store or anywhere else--for the first 10 or so years we lived there (we lived in Whitney, on the western edge of the county, from 1978 through 1999). houses on the lake, and they wanted to be able to buy beer and maybe go out to a bar and have a drink. But Hill County was a dry county. So the folks in Whitney got a local option election on the ballot to sell alcohol--not by the drink, just beer and wine in a store. And it got voted down. The county-wide election got voted down. The commissioner's precinct election got voted down. The justice of the peace precinct election got voted down. Finally, they got up a local option election in the constable's precinct--and it passed. So somebody built a little wooden shack-like store halfway between Whitney and Hillsboro, and that's where all the good folks in Hillsboro had to go to buy their beer. Those of us who lived in Whitney could go down to the one grocery store in town, or any of the mini-marts, and buy our beer there. Hillsboro eventually did pass a liquor-by-the-drink law before we moved away, and now you can buy a margarita with your lunch at El Conquistador. But I don't think there's an actual bar in town. When we moved to Clarendon, in the Texas Panhandle, we moved to a town that was established by Methodists. The cowboys at the early ranches around there called it Saint's Roost, and if you google Saint's Roost, you'll get sites in Clarendon. The story goes that the cowboys would go to Old Mobeetie for women, to Atascosa (now known as Amarillo) for liquor, and then down to Saint's Roost on Sunday after tying one on all weekend, to get saved after. Clarendon is a great little town, but if you want to buy beer--or any other kind of liquor--you have to drive at least 7 miles out of town to the town of Howardwick (again, on the edge of a lake) to find a store. I had to make a special trip to get tequila to make marinated chicken. So, unless the town is majority Catholic--and most small Texas towns outside of South Texas aren't--it's not going to have a bar downtown. It's just not. A lot of the time, there will be a bar nearby, but it's going to be a few miles outside of town. Even if the restaurants around are able to sell drinks with dinner--and that's pretty unusual, depending on the size of the town--the town will have written its local option so that the bar has to be X number of feet from a residence, from a school, from a church. Even Houston has rules like that. Even Galveston has rules like that, and Galveston's never had many rules about much of anything... It's famous for being rowdy. (They don't seem to be real strict about it here. There's a bar on the corner of 53rd St. and Ave. S that backs right up to somebody's house...) But in those small towns, they tend to have rules that an actual bar--something that sells more liquor than food--has to be outside the city limits. Often they'll be right smack on the city limits. But they're not downtown. Except in West. Which has all those Czech Catholics. Why is this important to a writer? Because you need to be aware of the screwy stuff like this. Just like you should know that in Pennsylvania, you have to go to a Beer Store to buy beer, and you have to buy it by the case, and you can't buy any less than a case, but you can't buy liquor there, you have to go to a different store--you should know that in Texas, because of local option, and because of all the Baptists and Methodists and Presbyterians (I'm a Baptist myself, but not so strict), liquor stores tend to be either outside town, in the resort areas, or on the fringes of town, if it's a small town. If it's one of the big cities, pretty much anything goes, except a bar near a church or school. I've been thinking and thinking about what I might like to discuss next, and decided I'd go on with what I originally planned, which was to talk about the various regions of Texas in a little more detail, rather than skipping off to talk about--oh, weather or wildflowers or something. So, I'm going to start east, in the Piney Woods, and head west from there. Or maybe south. Dunno. East Texas is a little different from the Piney Woods. Some folks define East Texas--which is a distinct region of the state--as everything east of Interstate 45. However, the territory along the coast, around "The Golden Triangle" (Beaumont, Port Arthur and Orange, right by the Louisiana border) is distinctly different from the Piney Woods area. It rightly belongs to the Coastal Bend region. Some people deny that Houston has any part of the Piney Woods, but those pine trees come down through Huntsville, Conroe and The Woodlands right into Houston. I put up this map because it helps to show the disputed definition of East Texas. Those stripey counties are the disputed area. I don't think East Texas goes that far west. In my not-so-humble opinion, East Texas runs along that red area line, and then cuts south to Galveston Bay (that big blue indent). Everything east of that is East Texas. But only the red counties are the Piney Woods. I'm trying to write this blogpost for writers, including things that writers need to know to set their books in Texas and to choose the types of setting they want to use. So. The thing about the Piney Woods region is that it's full of those small towns that "hearth and home" authors like to write about. Tyler and Longview are the two largest cities in the Piney Woods, both sitting on I-20, each one a little under 100,000 people. Tyler is just under 100 miles east of Dallas and Longview is right at 40 miles farther along. There's considerable countryside between Dallas and Tyler, not so much between Tyler and Longview. A lot of cows are raised in the Piney Woods, amongst the trees. Just not generally on what you would think of as ranches. Most East Texans agriculturists would consider themselves farmers rather than ranchers, historically raising cotton. Around Tyler, they grow roses. The lumber industry has also been important in the Piney Woods--all those pine trees... Up until the discovery of the East Texas oil field in 1930, cotton, cattle and lumber were the main businesses in the region. Oil and natural gas are the biggest industries now, but the others are still important. The Piney Woods was historically a lawless part of the state. When Texas was ruled by Spain and later, by Mexico, settlement in the area was forbidden. So of course, people settled there anyway. Because of the Big Thicket undergrowth making it hard for law enforcement to get through the forest, a lot of outlaws from the U.S. settled there for a lot of years. 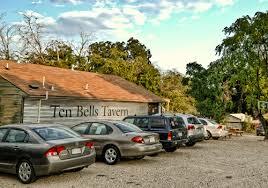 East Texas is considered the westernmost outpost of Southern culture. It's more South than West, so a lot of those folks hiding in the thicket were moonshiners. Underneath the tall pines, dogwood trees and Texas redbud trees bloom, along with Louisiana iris, and of course, bluebonnets in the open areas. 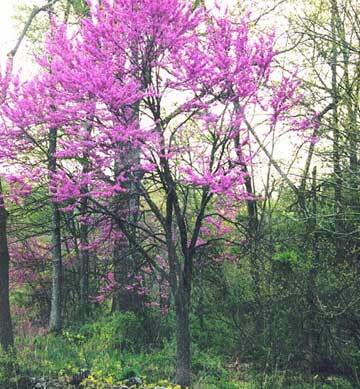 Redbuds are early signs of spring, exploding in purple in February. Texas spring begins early. 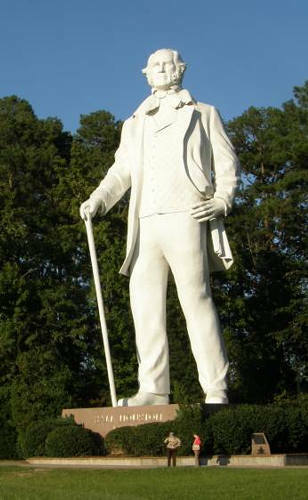 One of the latest landmarks in the Piney Woods is the giant statue of Sam Houston on the side of I-45 just south of Huntsville. Oh, and on a tangent, I've heard New Yorkers complain that "Houston" should be pronounced "House-ton," like the street in NYC. Thing is--the city of Houston was named after the man Sam Houston by people who knew Mr. Sam. They knew how he pronounced his name. You can't tell a man how to pronounce his own name. So maybe "House Ton" is the way to say the street in New York. But "Hyoos-ton" is the way to say the city in Texas. Just sayin'. Huntsville claims Sam because he lived there when he died. Sam Houston State University is in Huntsville. It's always referred to as Sam Houston, as in "I go to Sam Houston," or maybe "Sam Houston State." Never one or the other. 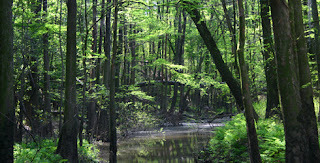 What else do you need to know about the Piney Woods? Not sure. Except that it's basically a duplication of what you will find in northern Louisiana. Lots of trees. Lots of cotton fields. Smaller farms. A fair number of oil and gas wells. And more trees. Some parts have some nice rolling hills. Some parts don't. 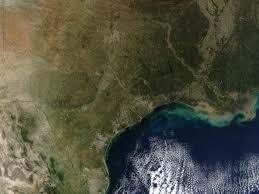 The southern part of the Piney Woods is an hour or two from Houston. The northern part isn't far from Dallas. But when you're driving east from Dallas on I-20, you don't really hit rural countryside until you get past the turnoff to Commerce (which is where East Texas A&M University is). Commerce is right on the edge of the Piney Woods. Just remember--you're not really going to find a ranch in the Piney Woods, which takes up most of East Texas. Cattle, yes. But not a "ranch." The land was just divided too small. So if you want to set your book on a ranch, go west of Dallas. Or north or south. Just not east.